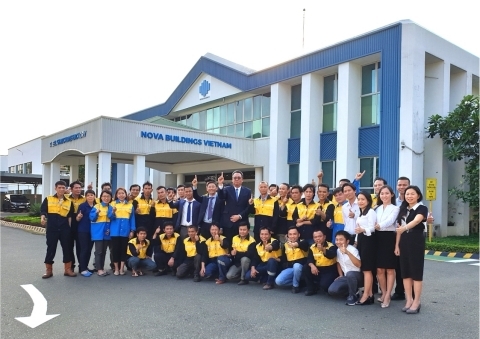 At the beginning of the year, Nova Buildings Group announced the acquisition of BlueScope Buildings’ key fabrication assets at Bien Hoa City in Dong Nai Province, Vietnam. Since the announcement, the Group had taken over the steel structure fabrication site situated about 30 kilometres from Ho Chi Minh city. Preparations had been underway to refurbish and prepare the site for operation. “Nova Buildings fabricates pre-engineered structures according to international quality standards. Since taking over the fabrication assets, our operation team has been working hard to put in place standard production procedures and quality inspection processes. The focus has been on training shop floor operators and ensuring all our welders have necessary qualifications and certifications. With the acquired facility and its equipment been in good operating conditions and readiness, and the diligence of our operation team, the preparations for operation restart is ahead of schedule. We are now pleased to be producing the inaugural batch of steel frames for our customers’ projects in the region. A plan is also in place to ramp up production quickly with projected increases in demand in our sales pipeline,” said Mr Cheong Ku Wei, CEO of Nova Buildings Group. The Bien Hoa facility is now ready for full scale operations, and orders for new pre-engineered building projects will be fabricated here and shipped to both domestic and export project locations in southeast Asia and other parts of the world. The facility has an annual capacity for steel frame fabrication of up to 12,000 tons per year and is envisaged to be Nova Buildings’ key manufacturing hub and export centre. The plant is led by key operational team members who formerly managed facilities under BlueScope Buildings, ensuring the legacy of quality and efficient manufacturing lives on and the benefits are passed on to our customers. Nova Buildings is headquartered in Singapore, with local business entities incorporated in Indonesia, Malaysia, Thailand and Vietnam. These entities with experienced in-market sales and engineering team will work closely with clients to provide competitive and functional pre-engineered buildings integrated with a broad range of quality building products and systems sourced locally with strong domestic aftersales support. The Group is backed by Fintonia Group, a Singapore-based private equity firm, in strategic partnership with major investors from the construction industry in southeast Asia. For more information on the business and office locations, please visit our website at www.novabuildingsasia.com.